Last week my son and I had a bit of a tasting adventure. We tried brussels sprouts for the first time. Gavin loved them. I thought they had a bit of an earthy taste to them, but I think I would try them again in a non-pureed form! 1. Just 6 brussels sprouts contain 90% of the daily recommended intake of Vitamin C.
2. If overcooked, brussels sprouts will release an unpleasant sulfur odor. 3. When selecting brussels sprouts make sure they are firm, that the leaves are not loose but tight and compact, and that the color is bright green. 1. Wash, cut off end and remove outer leaves. Cut in half. 2. Place brussels sprouts and 2 tablespoons of water in a microwave-safe dish, cover with plastic and cook for about 5 minutes (until brussels sprouts are easily pierced with a fork). 3. 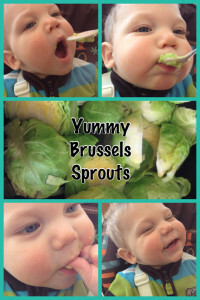 Place brussels sprouts and cooking juices into a blender (I use a Vitamix) and puree. You may add 1/4 to 1/2 cup of water as needed to develop a smooth texture. 4. Spoon brussels sprouts into ice cube trays or desired containers and freeze. 5. Thaw in refrigerator, the microwave or by placing in warm water. Serve lukewarm. This entry was posted in Baby Food and tagged baby food, blender, brussels sprouts, potassium, Vitamix, wholesom baby food. Bookmark the permalink.